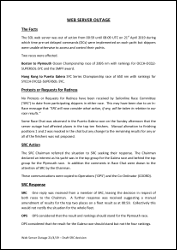 Sailonline.org is owned and operated by Sailonline NavSim AB, a not for profit, community-owned company. Sailonline's mission is to offer a superior internet-based sailing and navigation simulation to the global sailing community, whilst ensuring a future of growth and continuous enhancement to benefit its users through financial viability and long term vision. All Sailonline boats and their properties are purely virtual and do not necessarily reflect real world data. Sailonline is free for everyone to play and is supported by SYC Memberships. PLEASE ONLY REGISTER YOUR OWN USERNAME AND PASSWORD IF YOU INTEND TO RACE. GDPR - General Data Protection Regulations - Sailonline wishes to reassure all SOLers that it is aware of the regulation changes in relation to the protection of personal data. Sailonline cares about your privacy and will continue to let you control the personal information you provide. TILLYKKE Wolff!! HERZLICHEN GLÜCKWUNSCH HappyHour! 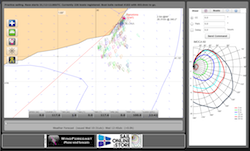 Once a year Sailonline celebrates the birthday of one of its founders, a professor of marine architecture who, with one of his students, decided to create a navigation simulator to test the performance of boat polar designs- the result was Sailonline! 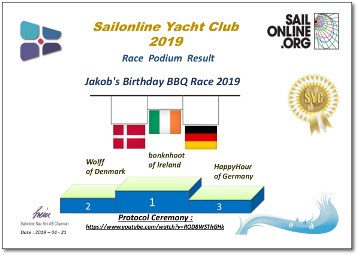 Although Sailonline is now owned by its community, we never forget our origins and in April we always race a mad slalom in the archipelago of islands close to Stockholm. The winds were unusually stable this year which, arguably, should have meant it was a simple race to sail but… with such a wide choice of routes from Revengegrundet toJakob’s Home, via Lokholmen, it wasn’t as easy as it looked! The race is always a game of two halves – the first, the run to Lockholmen offers a chance to head offshore and avoid the rash of islands, the second heading inshore to the finish. It is often after Lokholmen that the final top finishers make themselves known. Congratulations to everyone who took part and especially to our to our amazing podium! With 14 racers arriving in the first 60 seconds to take the top three spots was impressive indeed! 2019 is the second year that Sailonline has been the official virtual “buddy” for the Brisbane to Gladstone Yacht Race with the Queensland Cruising Yacht Club (QCYC), and it has been another success. From race start and the superb livestream and commentary – if you didn’t catch it live, why not watch it now here - to having the real fleet on-screen as direct competition, this truly was an interactive affair. SOLers flying the flags of 31 different nations took part in the race, and because of this global nature of our racing, our exit from Brisbane was made easier by an essential reduction in the number of marks to be passed correctly by the real fleet to stay in-channel. Why essential? Simply because the only sure way to be able to pass all the real marks would be to be at the helm and that is just not doable for the majority of our racers! We still had major turns at Redcliffe and Tangalooma which were challenging enough! The run up the coast to Gladstone was one of tactics for the front runners – the two reports from our podium tell the story! Our podium three, from Finland, Australia and the USA, are to be congratulated for bagging the top spots! Nicely done guys!